This story was updated Feb. 7 at 12:07 p.m. 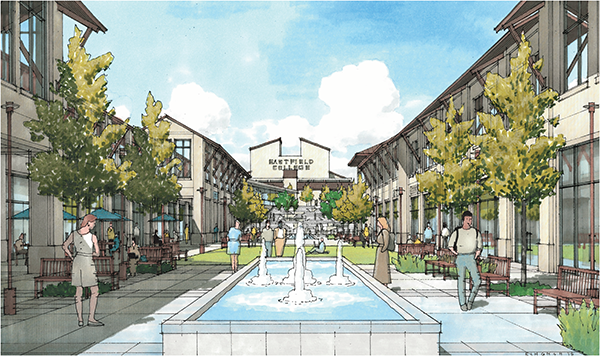 The DCCCD is set to hold a bond election of $1.102 billion for master plan related-projects and has been presented with details for Eastfield’s master plan. At Feb. 5 meeting, the Dallas County Community College District voted to hold the bond election on May 4. Following the introduction of rudimentary master plan designs in April 2018, architects and advisers paired with each DCCCD college to develop specific plans. Initial plans called for $2 billion in financial needs, something the district could not afford to pay back without raising taxes above their desired 2 cents per $100 rate. As a result, the board shifted to strategic priorities for the district and its colleges, something it plans to revisit annually. About $535 million would go toward a complete redesign of El Centro College and the addition of Innovation, Administration and Business Training Centers in downtown Dallas. About $332 million could be distributed to student-related needs, including keeping up with the increasing Early College High School program demands. The remaining money, $235 million, would be used to fund industry-aligned workforce projects that allow colleges to effectively prepare students for careers in allied health, advance manufacturing, early childhood development and more. The election allows voters to decide if the DCCCD can obtain the general obligation bonds, then the board could have the final say on how that money is used. At a Jan. 17 work session, board member Charletta Compton raised her concerns about how the bond sale could add to the district’s outstanding debt of $263.5 million. Despite Compton’s concerns, the district’s co-bond adviser Jeff Leuschel stated that other community colleges, such as Tarrant County College, have regretted not utilizing bonds to upgrade their campuses. While construction planning is underway, the district is still waiting on the bond election to provide the funding to cement the projects. 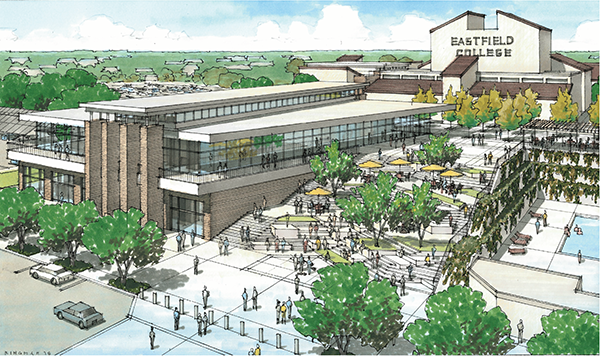 At a Dec. 4 finance committee meeting, Eastfield’s master plan architect Paris Rutherford presented updated and detailed concepts, including a central plaza, housing, sports facilities, shops and an arts center. This “Gateway Concept” was also presented to faculty and staff during Eastfield’s Jan. 17 convocation. Rutherford showed a redesigned road system that would place the main entrance of the campus near the Motley Drive and Interstate 30 intersection, as opposed to the previously conceived entry connecting Eastfield to Interstate 30’s service road. The track that now occupies the fields across from P building would be transformed into a park with small ponds at the center. Major construction of a new central plaza would rest where F building currently resides. Rutherford’s plans look to create a new structure in front of the Eastfield sign on the side of F building and implement a grand staircase that would allow students to travel from the street to the upper level. “We want to integrate nature into Eastfield’s environment to create a space that students are proud of,” Rutherford said. Housing will be available for lease as well. These units will be on the far side of campus next to Oates Drive. The cemetery will remain intact as the centerpiece of Eastfield’s new historic community park. The master plan will also have a newly created Harvester baseball sports complex on the school’s west side. The soccer fields that are there now will be expanded to include multiple new regional soccer fields. Specific student needs like a food pantry and bookstore would be mixed in with the commercial shops.